I’m still enjoying the last bits of Germany. I’ve walked the architecturally divine streets of the small town of Detmold, the location of the Hochschule für Musik where O is officially finishing up his last semester as Professor. And we spent several days in Babblesburg with my Schwiegermutter (mother-in-law) and Schwägerin (sister-in-law) and family in Babelsburg, which lies just outside of Potsdam, (which lies just outside of Berlin:) But before I share photos on my days here, I must get this cinnamon apple crumb cake recipe out to you. 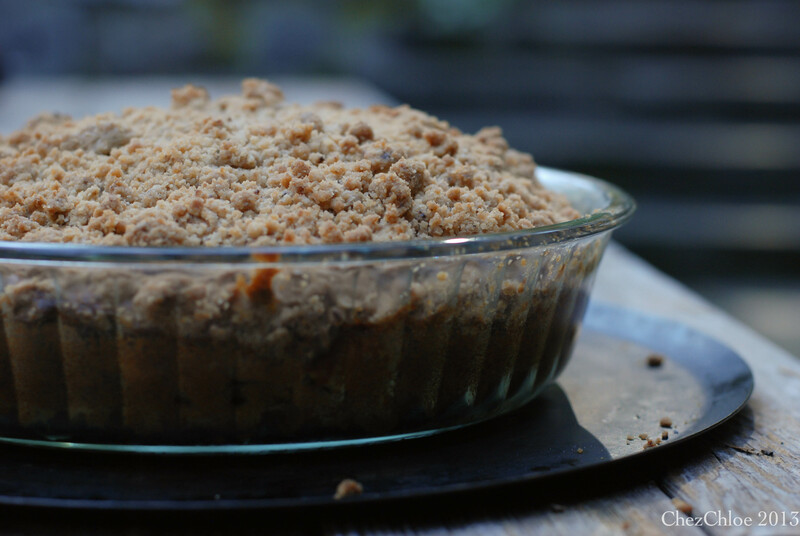 If you ever happened to search the Internet with the not so original words apple crumb cake, you might have already stumbled across this recipe from buttercreamblondie. It is a go to this fall for apple cake. I researched quite a few recipes and am not sure how this one was developed but I very much like the ratios. I followed the recipe exactly except for the addition of about a cup of honey poached quince. Ok I’m lying a little because the first time I had to cut in 1/2 cup full fat yogurt cause I didn’t have enough sour cream. Anybody out there watch the sitcom The Middle? Imagine me tucking my head to my chest and whispering “I’m lying”.